A New Zealand bus driver's out of the ordinary actions leaving the bus to help an elderly woman bus patron across the street is being widely praised on social media. 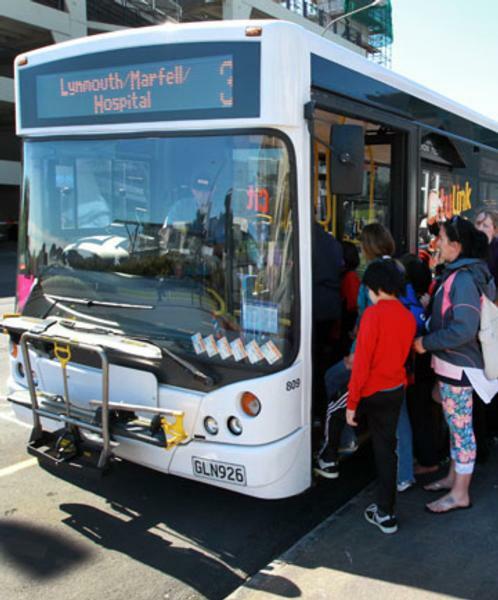 Friday evening New Plymouth council candidate Michael Riley, 18, posted about his afternoon experience on the local bus service operated by Tranzit Coach lines much to the delight of readers. "So today I was on the bus traveling home, an elderly disabled woman was on the bus with me, with all of her shopping, and she had a walker to help her," Riley wrote on his Facebook page of 3000 Taranaki residents. "When she was getting off, the driver not only helped her physically off the bus as she struggled to move, the driver turned the engine off and got off the bus, and walked her walker with her groceries across the street to get her as close to her house as possible." "I was speechless and don't think I have ever been so touched to see that in my life," he added. The public Facebook post, with more then 500 likes quickly gained international attention with Australian residents commenting "That'd never happen in Australia, that's hearty as." Other bus users commented on their own experiences with the 'most down to earth drivers'. Waitara resident Isadore Ponga said all of the drivers are considerate and go out of their way. "No other place in New Zealand would do this. Amazing! Big ups to the Waitara drivers. Excellent service!" A New Plymouth primary school staff member mentioned how their driver slowed down to point out a mother duck with her ducklings to the young students. "It's great the bus driver thinks of the passengers and something they may not have the opportunity to see if not pointed out." The post reached 21,000 people before family members of the driver confirmed the bus driver's name was Alan Campbell.